You've blown your opponents up using the 'Mechs from the Introductory Box Set and would like more firepower. Now you own Technical Readout: 3039 and would love to see some of those 'Mechs and vehicles on your gaming table. Grab your dice and start rolling, because these sheets are for you! 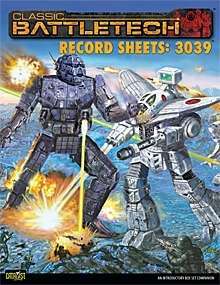 Record Sheets: 3039 contains over fifty pre-filled-out 'Mech record sheets that will have players firing autocannons, missiles and PPCs at each other in no time. More than thirty vehicle sheets bring the excitement of combined-arms game play to any table top. Two ready-to-play scenarios focus on the highlights of this volume, while the Quick-Start Creating Scenarios rules give players the tools they need to create their own fun scenarios. Finally, the complete Combat Vehicle rules take combined-arms warfare to a whole new level. NOTE: This is a PDF of the print Record Sheet book. Also, are these record sheets text searchable or are they images? For example, are all the classic unseen/reseen mechs included? This title was added to our catalog on October 31, 2011.